When we talk about aspect ratio, it usually means the ratio of a photo’s width to its height. This determines the shape of your picture. For example, a picture with a 1:1 aspect ratio is a square, while a picture with a 9:16 aspect ratio is a portrait - the first digit represents width and the second digit is length. The size of a picture is a related concept: it is the literal width and length of a photo in pixels. For instance, a 1080x1080 photo is 1080 pixels wide and 1080 pixels long. Instagram normally compresses the image you upload to make its size smaller, this decreases the quality of a photo. You should always try to upload photos of high resolution to ensure that they still look good after compression. Instagram used to only allow you to upload square pictures. This changed in 2015 but square still remains a wildly popular choice with Instagrammers. How do you take a great pic for a square post? 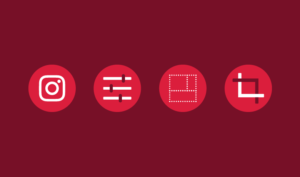 Very simple: try to make sure that all the elements of your visual composition fit in a square. Most phones allow you to visualize a grid when taking photos, which makes it simple to take square pics. The aspect ratio for these pictures should be as close to 1:1 as possible. Uploading a 1080x1080 pixel photo should give you at least a 600x600 pixel post after Instagram compression. The largest aspect ratio you can do for portrait pics is 4:5, if your picture is even 4:5.5 Instagram will crop out a part of it. The recommended size for portrait pics is 1080x1350 pixels. If you are looking to post a landscape pic, Instagram recommends you to go for a 1.91:1 ratio. 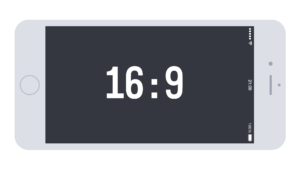 This is pretty restrictive, but if you can’t make these dimensions happen, you can actually go up to 16:9. The height of your photo should be at least 1080 pixels to ensure high quality. Just like photo posts, videos can be posted on Instagram in 3 sizes: square, portrait and landscape. The rules for square and portrait videos are the same as rules for photos. As for landscape, your aspect ratio can be anything between 1.91:1 and 16:9, but most people stick with 16:9 for one simple reason: this is the aspect ratio you get when you turn your phone sideways to shoot a video. 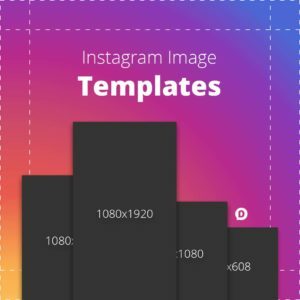 Unlike the situation with photos and videos, Instagram gives you a lot more wiggle room when it comes to sizes and aspect ratio of pics and videos you post on Instagram. Pictures and videos with aspect ratios of anywhere from 1.91:1 to 9:16 are acceptable. However, most people prefer it when stories take up the entire screen, so we advise you to choose media with an aspect ratio of 9:16. Both Instagram IGTV videos and live videos should be strictly in portrait orientation. Since live videos are broadcast from your phone as you’re filming them, they will be displayed on Instagram in whatever the aspect ratio of your phone screen is, normally, this is 9:16. 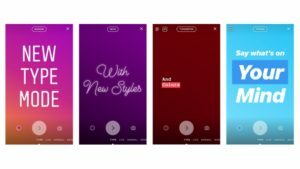 As for IGTV, your videos can have an aspect ratio from 4:5 to 9:16, and the latter is visually more appealing to the audience.